I hate to say, the only reason to put her back together is emotional. Boats are worth less than the sum of their parts. You could take the money and find another love. Sallvage title cars are accepted by insurance companies. The boating companies can't be much different. Of course, you'd have to have a survey from an accepted surveyor. If you do decide to rebuild and reinsure, might want to talk to your insurance company and see what they'd want in a survey and a surveyor. Might have to get the surveyor involved from the get go of the repair with multiple inspections or whatever the insurance company wants. Often hear that old boats can't be insured. Haven't that's the case. My 50 year old boat has full coverage but I had to get a hull survey and a separate rig survey to get it covered. Just googled your boat. 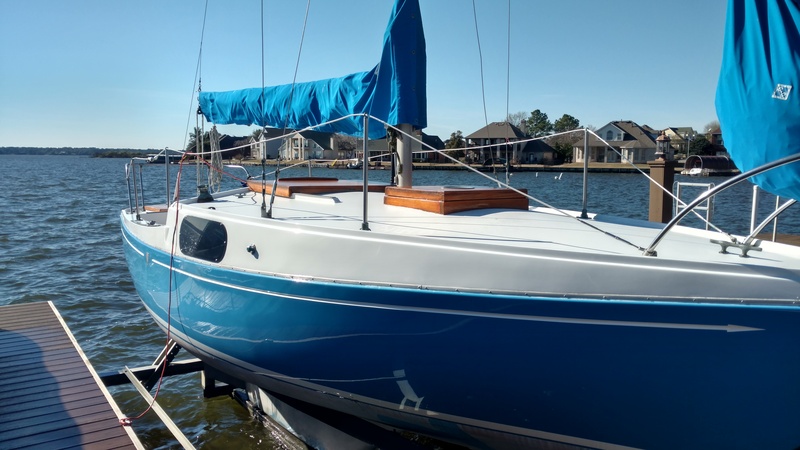 It looks like a lot like a Cal 25 up top, but with a full keel. A Cal 25 would a step up in performance and would be in your price range. Lots of 50 year old boats out there for cheap. You could even hold out for one that has been restored and has newer rigging. Put deposit down on Forte carbon mast (approx $5K total w/shipping from CT to CA). Have yet to settle all details as I await a schematic design and will then make some decisions on locations of exit boxes, cleats, etc...now I will have (3) (instead of 2, not wire-to-rope) halyards, all internal. Forestay will be slightly fractional, down some inches from the top. While chain plates are not under tension I am going to extract and inspect. The ears above the deck bent over when the mast took off for port-side, dragging the shrouds along for the ride (they stayed connected as did the back stay). Anybody know of new old stock chain plate replacements? Or those that might fit from another boat? Or am I destined to have new ones fabricated? Possibly un-bend the originals? Obviously I will know more when they are out. While it may or may not be a good financial move, I'm sure you'll enjoy every cent of it, when you're back on the water. Good luck with the refit. I would never unbend metal parts, I think you'll need to replaced or have them cut and rewelded. Sorry to hear your misfortune; I have been looking for parts for my 1964 Challenger and have found an old one (parts only) in Corpus Christie; If you want I can check to see if what you need is available. Many boats builders, like Columbia who built the Challenger 24 (I am ssuming that your boat is the Columbia Challenger 24), used the stock chainplates of that era which mostly were made by Merriman. That said, there were also other sources out there. Obviously Merriman is out of business, but the chainplates of the era typically were very simple in design so it would be pretty cheap to have a shop replicate the old ones. A word of caution about carbon fiber spars, they tend to be stiffer than similar profile aluminum spars, and so can increase the loads on the boat. Anybody know of new old stock chain plate replacements? Or those that might fit from another boat? Or am I destined to have new ones fabricated? Possibly un-bend the originals? The metal lost strength when it bent, and will lose more when bent back. Best used for a coffee table conversation piece now. With a new carbon fiber mast...isn't there a rule that says the new chainplates MUST be titanium? Pocket change, compared to the mast.